Early darkness, ice slipperiness, wetness, and fog: Passionate cyclists do not leave the bike in the garage during the cold half of the year, but should now pay attention to a few things. 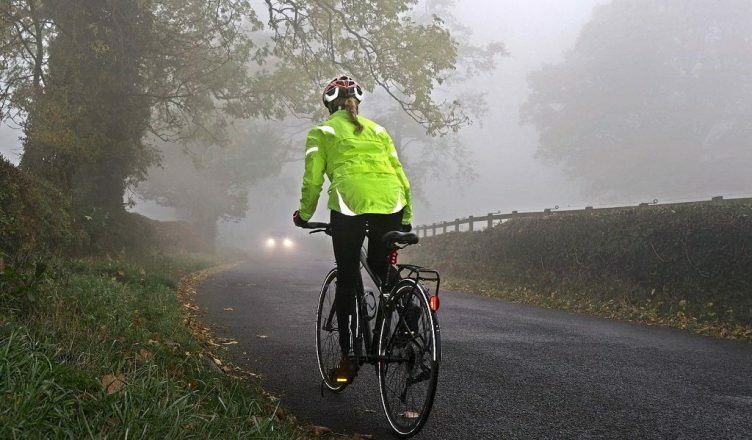 Dark, foggy, wet and slippery for cyclists, the current weather situation is a great risk. Nevertheless, many people do not want to leave their bike in the basement or in the garage in the dark season. More and more Germans are cycling in all weathers. According to the “Bicycle Monitor 2017”, an investigation by the Ministry of Transport, every third German uses the bike regularly – be it for the daily commute to work, for an extended weekend tour or for sports in the wild. At the same time, almost half of the interviewees do not feel safe when cycling – for example, due to missing or neglected bike paths, dense traffic or reckless drivers. Bad weather conditions in winter complicate the cycling life in addition. After all, cycling in winter-weary weather has several problems: On the one hand, the body must be protected from moisture and cold – but the thick clothing, cap, and scarf limit the usual freedom of movement and the field of vision partially. At the same time, the driving and braking behavior on wet or even icy paths is different than usual. And then you see because of the early darkness, reflections on wet roads and fog worse than usual and is easily overlooked by other road users. Under these difficult circumstances, cycling can quickly lead to accidents that, in the worst case, can result in permanent physical disability. The right clothing is also important for a safe journey: the best thing to do is to choose bright, reflective colors. “A reflective safety vest or shoulder strap adds visibility,” says Kayser. The optimal outerwear for cyclists, who are also traveling in freezing temperatures, should be “thin and breathable, windproof and water-repellent” according to the General German Bicycle Club (ADFC). Still, one should not freeze, which is why Ulf Hoffmann advises in his book “Das Fahrradbuch” on the onion principle: “If possible, put several layers on top of each other.” He considers fleece clothing as the best solution. In addition, there are cycling shorts that protect against cold and windproof material on the thighs and shins. When choosing clothes, the rule is the main thing to be seen. “Therefore definitely wear reflective clothing or a safety vest with reflective tape,” advises Hoffmann. “Also, the gloves should be provided with reflectors.” So in the dark hand signals are better perceived before turning. To keep the head warm and dry, Hoffmann advises to pull a rain cover over the helmet or to seal open helmets with adhesive tape. For the journey itself, drive carefully and slowly. Damp foliage or freezing wetness can make cycle paths slippery. “To reduce the risk of slipping, cyclists should refrain from sudden dangling and sharp braking maneuvers,” says accident expert Kayser. “It can also help to get some air out of the tires. This increases the contact surface of the wheel. “Anyone who lifts the pedals with emery paper will also have better grip when they are wet. And a bicycle helmet is indispensable, especially in the cold season. Last but not least, the bike should be serviced regularly. Cold, wet and road salt make the technology to work – no matter how robust the model is. Hoffmann recommends lubricating the Bowden cables well with thin oil or Teflon grease so that the brake and the circuit do not become stiff. Greases also include screws and levers, as well as the bicycle lock, so they do not freeze in freezing temperatures. However, there is little help when the chain slips. This can happen quite quickly in slush when ice is placed between the cracks. Therefore, the ADFC advises cleaning the wheel more often – especially the chain, which then has to be oiled again and to check the light and brakes before each ride. In general, the brake pads must be replaced at the latest if the transverse grooves are no longer clearly visible. Deutsche Vermögensberatung AG also advises the use of an emergency app. A security app sends the most important information to the helpers in case of emergency and displays the position of the user. Especially for cyclists who are often traveling alone, such an app is worth considering.